The Congress of World Hmong People (CWHP) will be screening David Beriain’s documentary “The CIA’s Lost Army” at the European Parliament in Brussels on 11 April 2018. 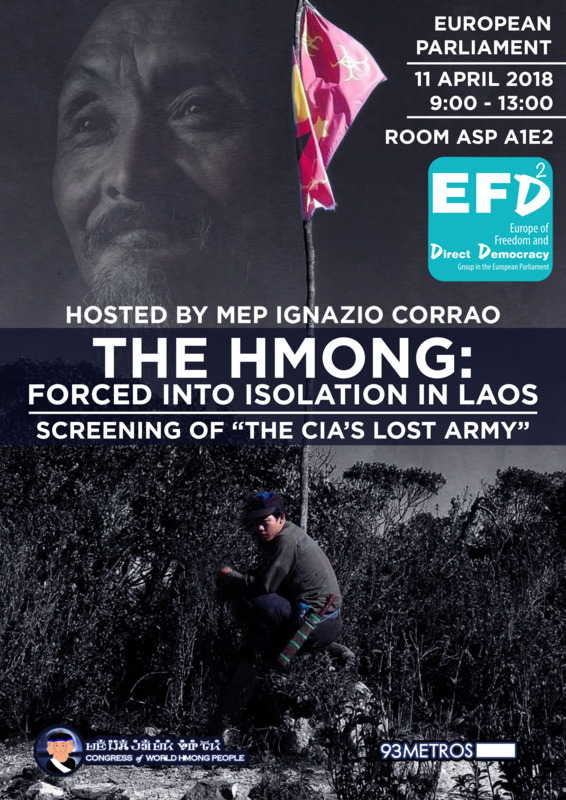 Hosted by MEP Ignazio Corrao, this event will feature opening remarks from himself, from representative of the CWHP, as well as a testimony from Mr. Jack Jolis, a Vietnam War veteran. The movie will then be screened in its original version and will be followed by a Questions and Answers session. This event will shed light on the Hmong’s history and struggle, as well as raise awareness about the “Secret War” that still impacts the lives of Hmong communities today. This captivating documentary shines a light on the oft-forgotten precarious situation of Hmong communities who have been suffering under a brutal military campaign by the Lao Government, which has forced them to take shelter in remote jungle areas of Laos for the last forty years. Observers and the Hmong themselves are certain that only a third-party international mediation could create an atmosphere in which the Hmong would feel secure enough to have a dialogue with their government, which has continually oppressed them since the 1970s. 2-4,000 persons belonging to the unrecognized Hmong minority group, including children, are currently in hiding from indiscriminate and large-scale attacks by Laos’ military and security forces, which have intensified since June 2016. The indigenous communities are being subjected to frequent shelling by the Laotian army and suspect the government of using chemical weapons against the Hmong families who have taken shelter in the jungle. Moreover, the Hmong are suffering from uncompensated land grabbing, religious persecution, and random harassment by state authorities. The independent media blackout in Laos prevents the world from receiving information about the Hmong’s plight in the jungle. Therefore, David Beriain’s documentary aims to shed light on the appalling situation of these communities. The CWHP, with the support of documentary production company 93metros, further took on the challenge of exposing this footage to the world through this documentary screening taking place in the European capital. The emotionally stunning 1.5-hour investigative documentary captures the team’s perilous journey to the most affected Hmong communities. With a greater understanding of the Hmong’s cause among international actors, the CWHP hopes to eventually create a safe environment for Hmong representatives to come to a peaceful agreement to halt the ongoing atrocities against their people. For any questions regarding this event, please don't hesitate to send an email to y.marion@unpo.org.